In each gleeful laughter, the heart experiences contentment. In every sacrifice, there’s a goal to reach. In every luxurious treat, there’s a pain disguised. Behind the smiles are hidden sorrows. Why are there OFWs? No easy answer! Some may be happy to share their stories, but others are unwilling, and when forced, they have to fabricate and invent tales to make them feel better. I am called a hero in our country. I am a simple and ordinary citizen - a daughter able to deal with loneliness; a mother capable of giving; a wife ready to sacrifice for her loved ones. Poverty was the reason why I left the country in 1984 to work in Brunei at the age of 24. In my journey, my simple dream was to provide a better life and prosperity for my family. Although I am a college graduate, it was not easy to get a job. To provide for my family, I had to be away from them. Unsure of what might happen, only my determination and trust in the Lord kept me strong. For the first week of my stay abroad I felt as if I was on a different planet. I had to adjust since the working conditions were also challenging. I could hardly eat the food and the weather was totally different from the one I am familiar with. Foremost was the difficulty of understanding and dealing with the attitude of other nationalities and culture. I found that the life of an OFW is not easy. It was not the life I imagined it to be. It was hard to love something new, particularly doing all the household chores alone, not being able to rest since you have not finished all your work. I felt like a robot run by a battery and operated by remote. I had no choice but to obey every time a button was pressed. I would tremble and become weak-kneed each time I felt discriminated by people around me. I can endure the pain of a tired body but not the thoughts that bring me pain. But since I chose this kind of job, I had to deal with it no matter how difficult it was. When I was lonely, the photographs of my loved ones kept me company. I would have loved to talk with them often, but it was only through telegram that I would be able to relay my ‘hello’ and tell them that I miss them. Sometimes it would take weeks or a month before they were able to read my letters. It was such a big concern when a member of the family got sick and I was not able to visit. There were special occasions I never had a chance to attend. All I could do then was to think that soon – any time, any day, any week or any year my contract would end. Even if I wanted to go home, it was not possible. I would just imagine the possibility of swimming the vast ocean or flying on the wings of a plane just to visit my family. It was not easy to sacrifice. But I knew that everything I did was for my loved ones’ future. Although life abroad was difficult, still there was joy that matched each moment of loneliness. 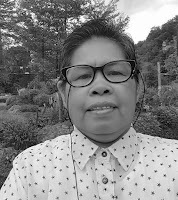 I spent eight years in Brunei and I was able to help my parents, siblings and other relatives. I believe that all my sacrifices were worth it. Knowing that they are happy also made me happy. After eight years as an OFW, however, I decided to come back. I was glad but sad at the same time. I was glad because after a long time of loneliness away from my family, I had a chance to be with them. When they received me with their smiles, all my sorrows melted away. On the other hand, I was sad because for eight years, I was not able to save for myself. My family did not know that every pay day and end of contract, only receipts remained folded in my pocket. I am a single mother, blessed with an only child. I felt the painful truth that even if we were together there would be a void and emptiness if I were not able to provide for my daughter. It was not an easy decision to make. I was not able to raise my daughter. My presence and love were missing since I was too far away from her. There was that constant fear of her going astray, becoming rebellious, and growing up lacking the guidance of parents. But my biggest concern was her future. Nothing would happen if I decided to stay with my daughter since we did not have enough money to live on. For that reason, I decided to work abroad again. This time I applied for work in Singapore as a domestic worker. It was a painful experience since my employer had a bad attitude. I experienced getting sick because of fatigue and overwork. I thought I would be able to finish my contract and extend my patience; but, after a year and a half I ran away and went to the Philippine embassy to ask for help. God was kind and I met a person who was instrumental in sending me home to my family. I am grateful to that person. While my daughter was growing up, her financial needs were also increasing. Again, despite my fear of going away, it was overpowered by my desire to provide for my daughter’s future. I did not want her to suffer the same fate I had. I decided to go to Kuwait. Upon setting foot in that country, my fear doubled. There were so many grim and harrowing stories experienced by OFWs in Kuwait. I went through another adjustment period. The place is totally different from where I have been. This time it is a desert. The climate is extreme. It can get very cold, like living inside a fridge, during winter. On the other hand, it is very hot during summer. It is as if the sun is your neighbor, the extreme heat sometimes induces headaches. In Kuwait, my employers abused me. They were so heartless that they kept me locked inside the house. They would hide food from me. They made me work like a slave animal. They would slap me and I will never forget one time when I almost fell down the steep stairs while they were hitting me. If they were still not contented with punishing me, they would hide food to keep me hungry. I would scavenge for their left-overs and if unlucky, I had to go to the extent of digging the trash can just to find some food. I experienced all kinds of their inhumane treatment. In my self-pity I blamed myself and regretted choosing to leave my daughter behind just to go through such an ordeal. At that time, I did not have any other choice anymore. I was cut-off from any outside communication and prayers were my only hope. One day God answered my prayers. While doing my chores, my mobile phone, which was hidden by my employer, suddenly rang. My agency unexpectedly called and asked about my situation. I told them my ordeal and asked for their help before something bad happened to me. Finally I was freed. I prayed that I did not have to go through the same experience again. A new employer took me in. She has a daughter named Lulu. While the kid was growing up it was discovered that she was autistic. She would strike or kick me whenever she would go on a tantrum. I ended up with bruises, scratches, and sometimes even bites. Living with a special child was a new challenge for my strength and patience. It was not easy to understand her, but despite her condition, I chose to care for her. In three years, the family, especially their daughter, became so close to me. I consider them my second family. Both mother and daughter became dear to me because they showed the same love for me. They would always tell me that they need me. I would stand as a surrogate mother to Lulu whom I raised as my own daughter. I worked for them for the last 10 years because they were so nice to me. They helped me have a better life. Because of them, I was able to provide for my daughter. She had since finished her schooling and now has a good job. I was also able to provide for the education of my other relatives. In my more than 30 years of work abroad I learned a lot despite the hardship I went through. I may not have built a mansion, but the biggest prize for me is to see my daughter complete her studies. It feels like heaven in our bungalow whenever we are complete as a family. As they always say, there are no such words as ‘I am tired’ for a parent like me. For every sacrifice, there is a sweet reward at the end. It is so fulfilling to remain standing and not give up. At present, I am blessed with a new partner to complete my happiness. Moreover, I became a member and administrator of a social media community group called Pinoy Expats/OFW Blog Awards (PEBA ) that provides assistance to other OFWs. I actively participate in sharing information for OFWs in our on-line advocacy. I hope that my story and experience will serve as an example for other OFWs. I believe that God will always bless us with good health, and an endless determination to face all of life’s challenges. God is good. Never lose hope. With God’s grace all difficulties could be forgotten with each passing day. With the struggles I went through, I am convinced that He is always there, ready to embrace us whenever we need help. He will not give us challenges that we will not be able to deal with. God will never abandon us and will always be on our side. We can also depend on our family who will always be there to love us. 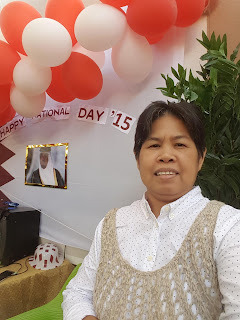 Esther A. Quiba, caregiver, Qatar. Good education for their kids is a prized trophy for most OFWs. Esther has been an OFW for 30 years as a domestic worker and caregiver. She has gone through ordeals just to provide good education for her daughter. Esther is currently with a good employer and taking of her ward with autism. Her free time is spent with online volunteer work and advocacy for other migrant workers.